Halflings on the world of Krynn are known as Kender. Armed with a childlike curiosity, a scathing taunt, and the ability to pick any lock or pocket, kender are often branded nuissances. Yet they are born to adventure, driven by wanderlust, and on occasion, driven to heroism. For more information on Kender, see Races of Ansalon. Average Weight: 75 – 85 lbs. Fearless: You gain a +5 racial bonus to saving throws against fear. Nimble Reaction: You gain a +2 racial bonus to AC against opportunity attacks. Taunt: You can use Taunt as an encounter power. This ability replaces the Second Chance power of the standard halfling. You unleash a verbal assault against your foe that throws him into a rage. 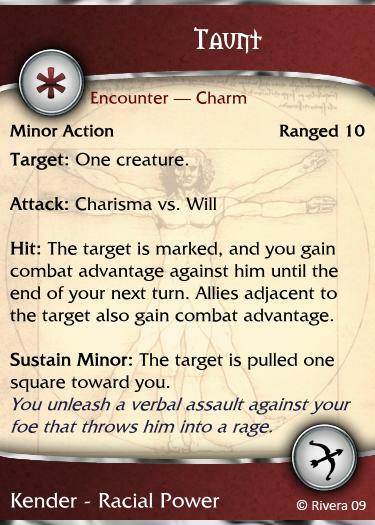 Hit: The target is marked, and you gain combat advantage against him until the end of your next turn. Allies adjacent to the target also gain combat advantage. Sustain Minor: The target is pulled one square toward you. While true kender delight in the discovery of the world around them, afflicted kender shirk in fear. They have lost the joy, hope, and innocence that true kender possess. Rather than draw attention to themselves with garish colors, they dress in dark browns and blacks. Many kender become afflicted through curiosity of the shadow power source. Drawing power from the Shadowfell requires sacrifice, which often comes in the form of a kender’s innocence. For more information on Afflicted Kender, see Races of Ansalon. Afflicted kender do not get the Bold ability. Is there a place with the Dragonland Races for the Skills and Powers (AD&D 2nd edition)?